All photos taken since January 2010, most in Bundaberg, one in Caboolture and one in Carina. Of the next nearest 17 such sign near my home I only counted one which complied. That is around schools at Cannon Hill, Morningside and Balmoral. The last sign (on right) was installed at the start of 2010 school year and cost about $10,000.00 each installed. See bottom of page for visibility test of new type sign. This new type sign has double zeros and am and pm larger that the minutes. Both items are incorrect. This photo was taken on 3 June 2011. On Moggill Road at Moggill on the approach to the Moggill State School. I am informed that this change of operating hours was undertaking of Queensland Transport staff/contractors. Without actually having a ladder and ruler with me to measure the sign. The amended hours of operation are only about 66% of the height they should be and the am and pm are both larger than the requirement set out in the Manual Uniform Traffic Control Devices. 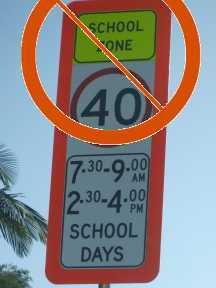 The Courier Mail on Tuesday 29 November 2011 carried an article setting out the number of traffic offences at school zones in Queensland. How much was this to do with non-compliant sighs with undersized text? Can the public of Queensland continue to employ public servants who cannot get it correct? Any traffic sign which resembles a correct traffic sign is enforceable but why should tax payers put up with incompetent actions such as this? 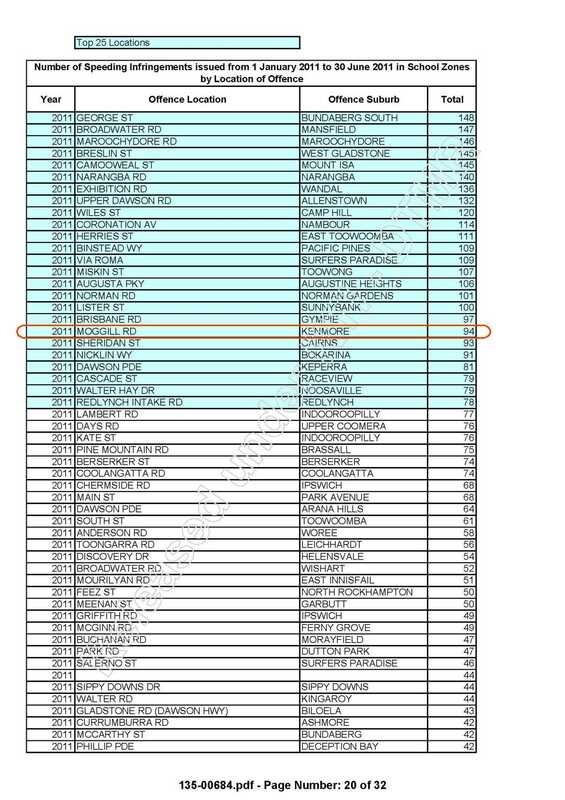 Queensland Transport the Right to Information Act 2009 disclosure log. Which is more readable whilst driving? 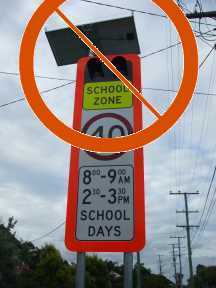 During the period about 1993-5 I became aware of the non-uniformity/conformity of School zone speed signs. What I was concerned about was the recent addition of double zeros which were being added after the hour. e.g. 7 00 - 9 00 am instead of what was the norm of just 7 - 9 am. With similar display in the afternoon of 2.00 - 4 00 pm. 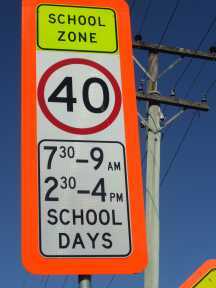 These added characters and numbers reduce readability whilst travelling on 100 kph highways especially when different schools had different time zones. After contacting the state authorities and the manufacturers over 15 years ago nothing has changed. During January 2010 whilst I was on holidays in Bundaberg in Queensland, I watched the local state member on local television news one evening. He was showing concern about the safety of the school students within his electorate. 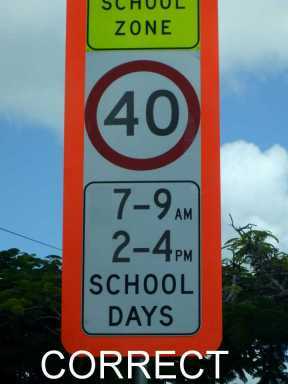 He was asking why his electorate had not been supplied with the new school speed signs with flashing lights as school were in south east Queensland. He said the Bundaburg's children need protection as much as Brisbane's children. 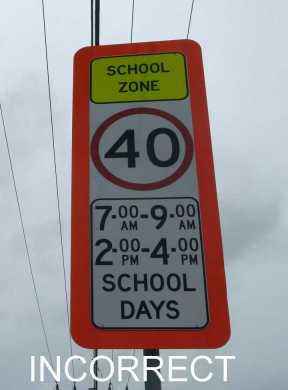 During that TV program several local school speed signs were shown. Some of which I noticed were in the same format I had complained about many years before. 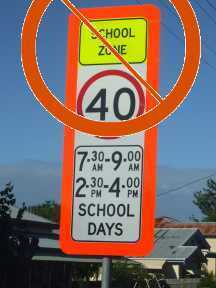 Consequently I photographed every school speed zone sign (61) I could find both in and around Bundaberg only to find nine school speed zone signs which were compliant. 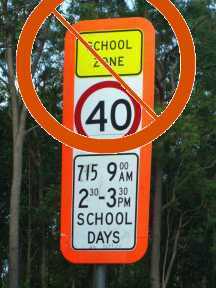 Upon further investigation I discovered that most of the school speed zone signs in that city do not comply with the Australian Standards (AS1742.4-2008) and or the approved Queensland layout R4-Q01 which makes no allowance for starting times to have "am" or "pm" added. 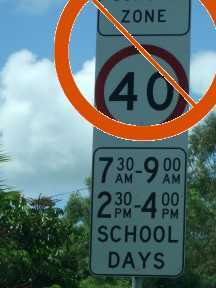 Queensland's Main Roads have issued a revised drawings for R4-Q01 which removes any doubt and does not allow for "00" after the hour or starting "am' and "pm" notation which was never allowed for on R4-Q01. I now await the decision of the Queensland Government and local councils how they intend to over come this monumental blunder generated over more that 15 years. 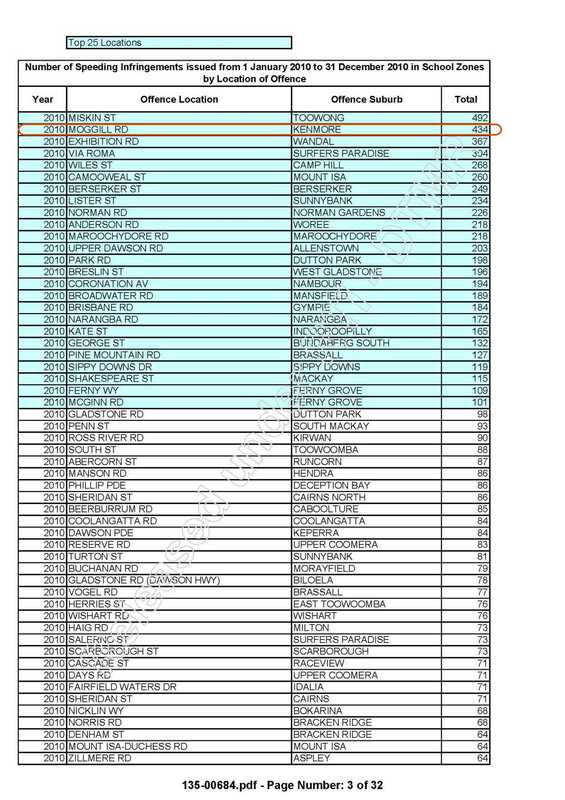 Just how many traffic engineers are employed within state government and local government over the past 15+ years? Yet none of them have noticed this non-conforming safety issue or managed to have something done about it. Why are we paying such a high price for traffic engineers if they cannot spot such errors in more than 15 years. Why did the manufacturing company make non-compliant sign for so long. Their excuse is that the customer sends the design to them for manufacture. Apparently they will take no responsibility for this 15+ year blunder. notation shall not be shown. AM or PM on the finishing time." Also the height of the am or pm was to only be 3/4 the height of minutes. The School Environment Safety Guidelines state that speed restriction times must only be in 1/2 hour increments. The front cover of the Manual of Uniform Traffic Control Devices. 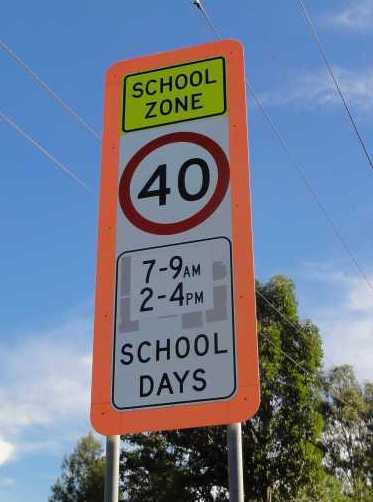 Visibility test on new flashing School Speed Zones at Creek Road Carina (State Primary School) and existing signs. Just down the side street just how visible??? 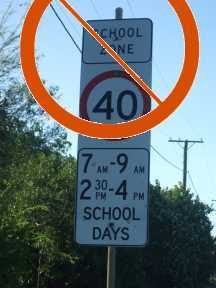 No other Australian State or Territory uses "00" after the hour nor "am" or "pm" after the starting time on school speed zones unless it is a all school day zone. e.g. 7 am - 5 pm.